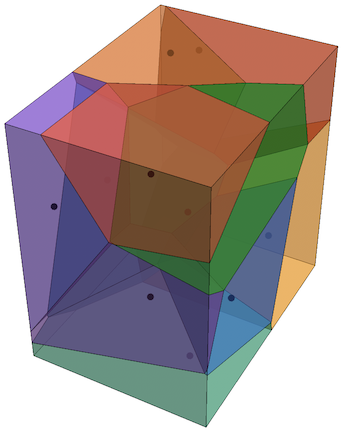 Here I will show how to create 3D version of VoronoiDiagram in Wolfram Language. Note that there's currently no way to represent a collection of 3D Voronoi mesh cells in a MeshRegion or BoundaryMeshRegion. 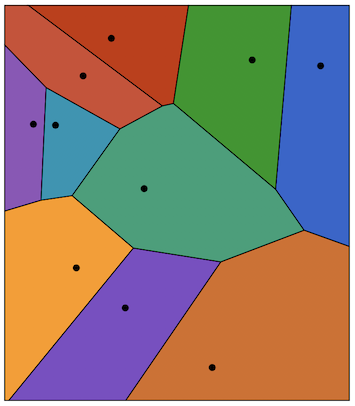 Here's a routine that takes the dual of the DelaunayMesh and returns an Association where the keys are the points and the values are their respective Voronoi cells. Thanks for this function! will be very useful actually! 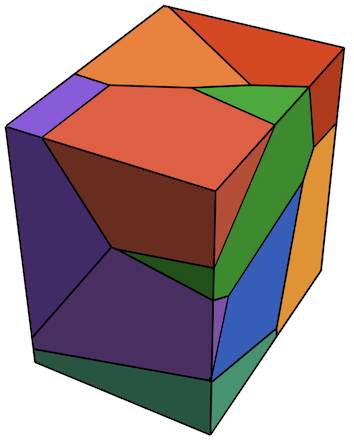 Some time ago, I submitted this Wolfram Demonstration: Three-Dimensional Voronoi Mesh but, since I did not use the Regions functionality, I had to limit it to 2D cross sections of the 3D mesh. Hope they includeChip's excellent function in V12? A most excellent function and one that is needed. Thanks ! the function should be scaled up and made part of version 12.0 !